If you are a long time reader of this blog, 1) it’s gotta be rough being you and 2) you know that along with my work with the United Cardinal Bloggers, I started a little thing called the Baseball Bloggers Alliance a few years back. Eventually things piled up and I had to turn it over to our friend Bill Ivie, but when I was putting it together it was great to see all the blogs that were interested in joining up and participating. 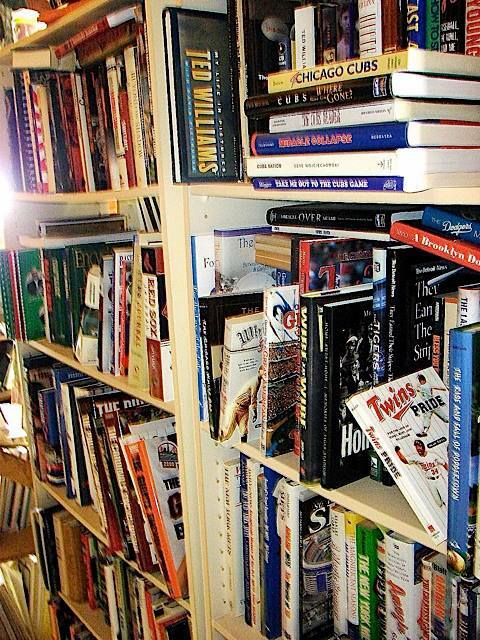 One of those blogs was Ron Kaplan’s Baseball Bookshelf. If I remember correctly, Ron was one of the earlier members of the BBA and one of the first that wasn’t focused on a team or on baseball in general but a specific subset of baseball fandom–books. Oh, OK, sure occasionally he deviated from that idea but, for the most part, you could find out about a lot of great books from checking out his site. So it was with pure delight that I saw in the University of Nebraska Press catalog Ron’s publication, 501 Baseball Books Fans Must Read Before They Die. It’s always nice to see a name you recognize and (at least casually) know in print, isn’t it? Little did I know just how inadequate this tome would make me feel. I like to think I have a solid baseball library. You’ve seen me review a number of books and I have baseball materials scattered throughout my home. I started to think that I had a pretty good thing going here, until I saw this picture on his Facebook page. That was followed up by another picture of surfaces covered with piles of books. By his estimation, he has about 2000 different ones lying around his home. It’s mind-boggling to think about. My 100 or so books seems ridiculously paltry by comparison. So there’s no doubt that Ron was extremely qualified to write 501. I don’t know that Ron owns all the books that he covers in this book, but I expect that he does. I have no doubt that even if he doesn’t own them, he’s read them. Once you read this book, you won’t have any doubt on that score either. This isn’t a ranking either. It’s not “This is the book you HAVE to read, followed by the book you should read next.” Books are grouped by section, like you’d see in a library. Analysis, biography, statistics, even children’s books. So if you are looking for a particular type of book, this is a great way to narrow it down. I started out trying to count how many books I either owned or had read and was doing OK in the first section or two, running about 10% or so, but quickly got to where there were so many books that I’d never even heard of that I gave up. I’d say I’d read maybe 10-15 of the 501, maybe a few more. Yikes. That said, and as great of a book as this is, it’s not perfect. There were a couple of books that I were surprised that were missing, such as the well-known The Glory of Their Times (which is referred to in one recap, I believe) and John Helyar’s Lords of the Realm, which I’ve seen held up as a shining example of what went on behind the scenes of baseball from before Judge Landis until the strike of 1994. Not that I’m an expert and they might well be inferior to some listed, but I was surprised that they weren’t on the list. I hate to mention the second thing that came to mind, because, well, we’ve heard enough about “East Coast Bias” to last us for many a year to come. That said, in the team subsection of the History section, there are 25 books listed. Eighteen of them are tied to a New York team (either Mets, Yankees, or one of the teams that left town like the Brooklyn Dodgers) or the Red Sox. Two others deal with the Cubs and two more Washington. That’s not a lot of coverage of a large swath of teams. Given that Ron is from the New Jersey area, it’s not surprising that a large store of his books probably do deal with those two teams and any list is going to be heavily weighted toward New York and Boston just because of the sheer number of books generated about those teams. Since he’s a Mets fan, it might have been difficult on a fan level to include so many books about the other team from New York. As a Cardinal fan, though, while it was very nice to see Three Nights In August make the cut, I wouldn’t have minded George Vecesy’s Stan Musial: An American Life or Peter Goldenbock’s The Spirit of St. Louis. All in all, though, this is an exceptional resource for literate baseball fans. I know it made me want to start checking books off and hunting up Amazon for some new things to read!